Time and again we see that the kitchen is the heart of the home. So as we near the holiday party season, you may be looking at your kitchen and wondering how it can work better when you're the host. 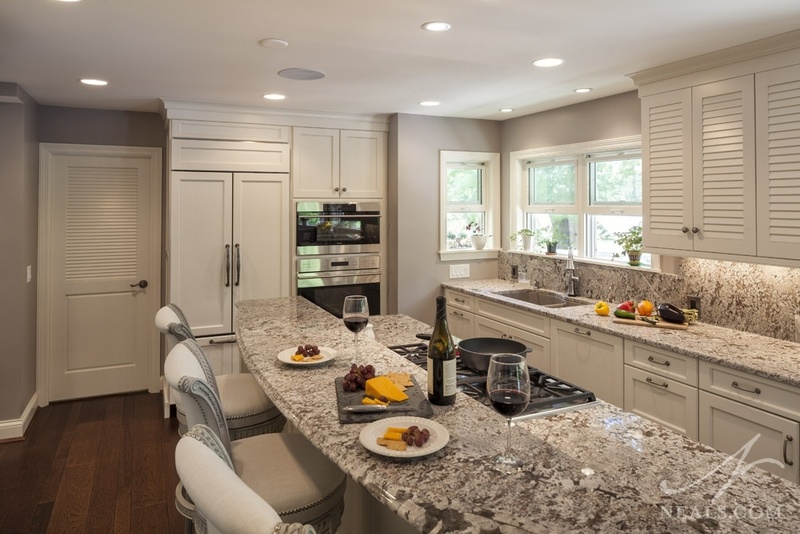 Entertaining comes with its own set of challenges and needs, and if you have guests over often, it may be worth while to adjust the form and function of your kitchen to account for a crowd rather than simply for your immediate family. The seven ideas below are some great things to consider. An additon turned this kitchen into a large open gathering space, perfect for daily use as well as parties. 1. Open the floor plan. Nothing stifles the atmosphere of party like cramming your guests in like sardines, so the first place to look is where and how you can open things up. An addition in your kitchen might be one solution, but even the removal of a wall to join two rooms can create a huge impact. 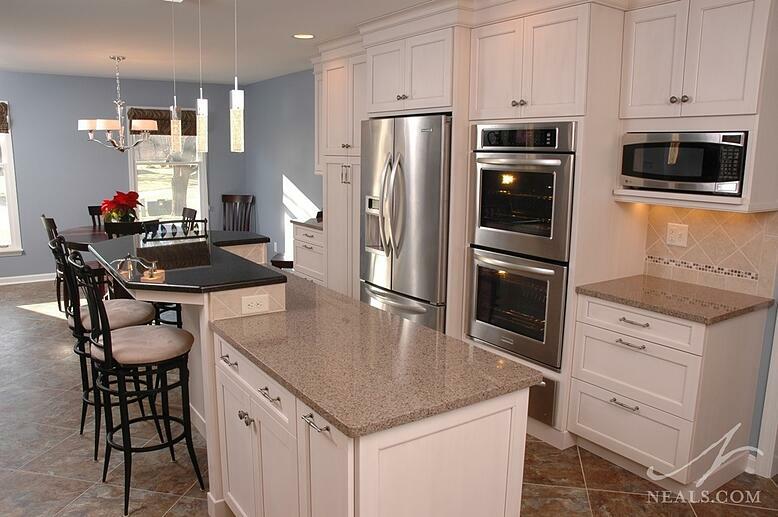 Think about the kitchen floor plan, and how it allows people to move from area to area, and into adjacent rooms. Look out especially for bottlenecks- places where the main flow moves, but is too small or awkward for the flow to transition smoothly. Don't forget about your kitchen's relationship to your outdoor spaces. Even in the depths of winter, your guests may want easy access to step outside. To gain space in this kitchen remodel, the exterior wall was pushed out 3 feet to provide wider corridors around the island. With all the prep work and cooking that comes with entertaining in your home, you're going to need space. You also want to have enough open counter to set out food, and not have confusion over whether it's ready to be devoured or if it's still in your working zone. 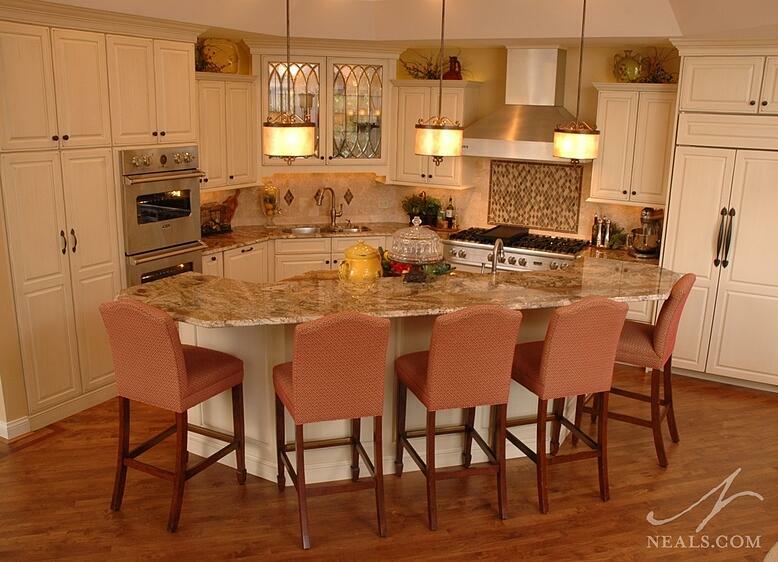 Multi-tiered islands are a convenient option, and don't necessarily take up a lot of space. Adding more than one island, fitting in a long penninsula, or creating a long run of counter outside the work triangle are additional ways to gain surface area. The working counter and eating counters are separated in this kitchen by both height and color. 3. Include seating in the kitchen. Even for days you aren't hosting guests, kitchen seating is a great element for any kitchen. The days of the kitchen table aren't over, it's just that the form has changed. The advantage of including seating in your kitchen is that family or guests can join you for conversation in the kitchen when you're in the middle of preparing the meal. Seating should be arranged near the work areas, but not inside of them. For some great ideas on including seating at your kitchen island, check out our post on 6 Hard-Working Kitchen Islands. A horseshoe-shaped island provides seating for five outside the working zone in this kitchen. 4. 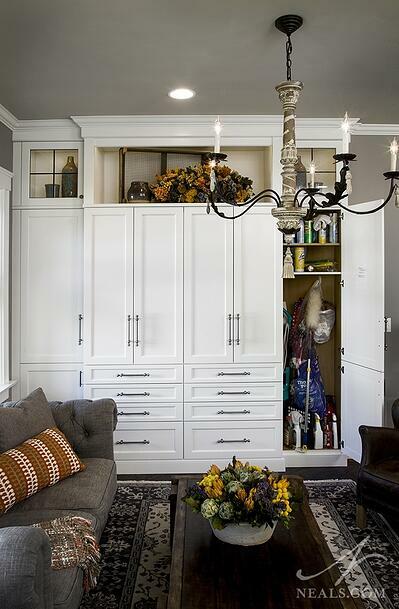 Find space for a beverage bar. More and more we are seeing the need for a beverage bar in the first floor of a home, rather than relegated to the basement rec room. A corner or short bit of wall can be converted to a bar in the kitchen, which is an ideal location for entertaining. Look at ways to combine your bar storage with your daily beverage needs (coffee, cold drinks, water). A small sink is also an ideal addition to the beverage counter. An under-counter refrigerator can provide the storage for beer, juices and other drinks. This can also be the home for your wine storage solution. 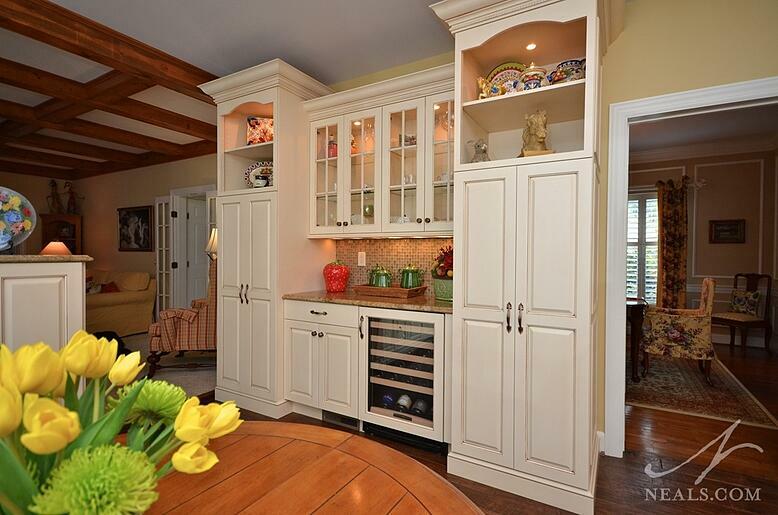 Situated between rooms, the beverage counter in this kitchen is a convenient spot for guests to top off. 5. Don't forget to include space for special occassion storage. 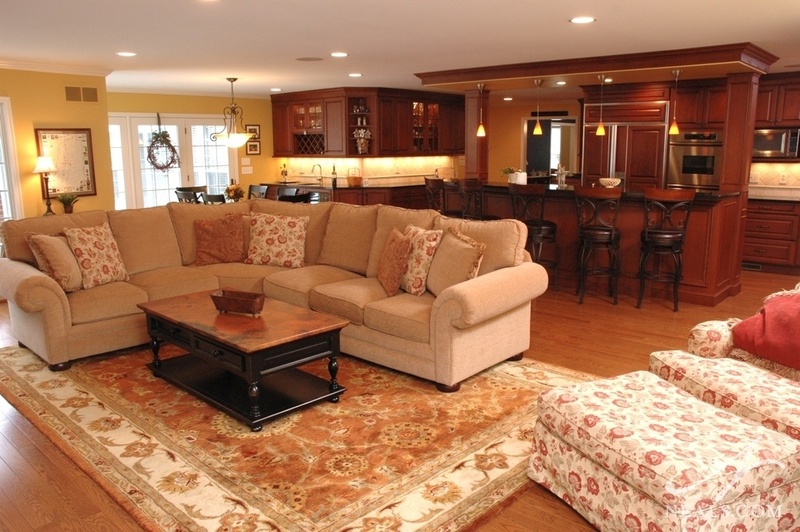 Look for the space to include storage solutions for all the items you regularly use when you are entertaining. This can include dishes and glassware, serveware, food staples, table clothes and napkins, or that special centerpiece that always comes out for all the large family meals. This may require more than one area in your kitchen, but be sure to position the storage to be distinct and separate from your day-to-day items. 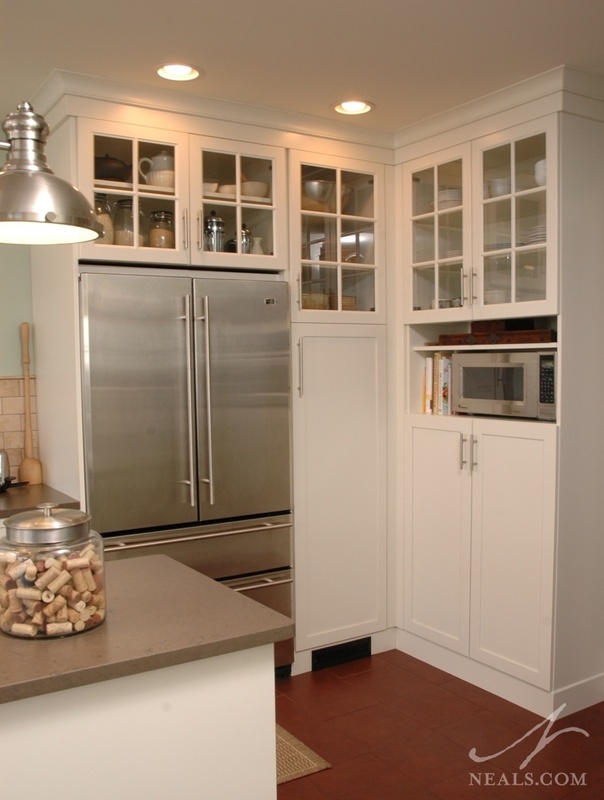 Display cabinets in this kitchen hold extra serveware. Lighting is a make-or-break element to any space in your home, but with all the tasks it handles in a day, proper lighting in the kitchen is a necessity. 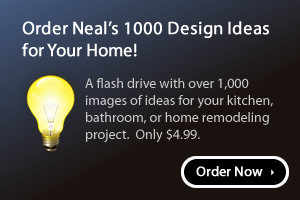 We've talked about kitchen lighting in the past, but to paraphrase, it's important to include the correct type of lighting solution for each of the areas in your kitchen for what you intend to do there. If your kitchen is going to act as the hub of your parties, you'll want to have a lighting scheme that can adjust through the day. Bright work lighting when you're getting everything ready, aesthetic lighting for the party, and low lighting when the evening begins winding down and the party has moved on to other rooms. 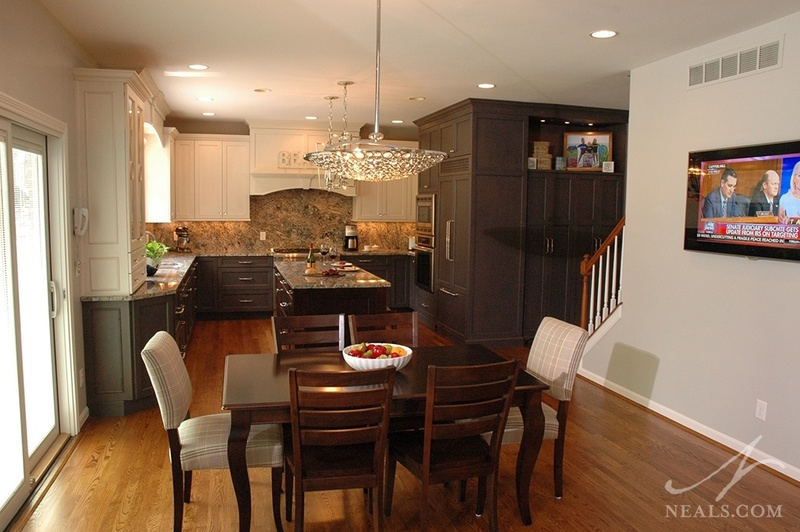 The lighting in this kitchen provides task, ambient, and mood lighting for any lighting need. 7. Make cleaning up the easiest part. The reality of entertaining is that you also get saddled with the clean up. Whether you typically opt for disposable plates and cups or use your fine dishware, you'll need a solution that makes the post-party clean up a no-brainer. Look for a hard-working dishwasher that can handle loads that may be a little more than full. Install a double waste basket pull-out near the areas where trash tends to accumulate during the party, or in an area that your guests can easily access. Work in a cleaning supply closet in your pantry or in a central location so that you've got a broom and cleaning wipes on hand rather than burried in the hallway closet or in an equally inconvenient place. A seating area at the end of this kitchen is home to a broom closet.